Who says NYC has to be expensive? The Big Apple Greeter programme www.bigapplegreeter.org pairs tourists with locals to show them around town. Your volunteer guide will give you an insider’s view of the city, perhaps taking you to their favourite burger joint or a cool new neighbourhood. There’s no charge, and your guide won’t ask for a tip either. 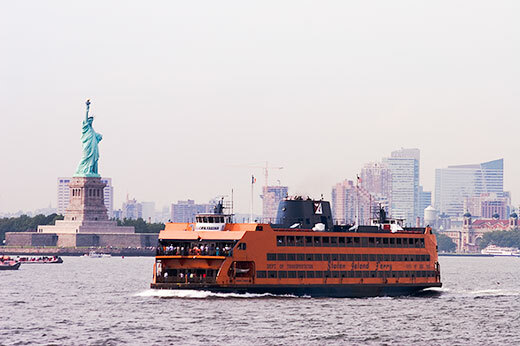 The Staten Island Ferry www.siferry.com treats 20 million passengers per year to glittering views of Manhattan’s skyscrapers and the Statue of Liberty. That’s 50 iconic minutes of NYC for nowt. Arthur’s Tavern www.arthurstavernnyc.com, a delightfully dog-eared spot in New York City’s West Village, has been hosting nightly New Orleans jazz and Chicago blues since 1937, and the same Dixieland jazz band since 1975. The cost to you: diddly squat. On Sundays, the throbbing Upper West Side Latino restaurant Calle Ocho www.calleochonyc.com quenches customers’ thirst by offering an unlimited sangria bar with any meal. Call in advance for your reservation. And don’t make any plans for first thing Monday morning. You saw the Empire State on your first trip and the Statue of Liberty on the second. On your next visit to NYC take home a souvenir with a difference: a haircut. Sign up at www.bbumodelproject.com and you’ll be a class dummy for the proficient students at the Bumble & Bumble University. Thanks for so many useful links.